I haven’t felt much like posting for the past few days. Some of you may know that I have several pet goldfish. I have had fish as pets for many years and have been surprised to learn what intelligent creatures they are. The keen aquarist becomes as attached to his fish as a dog owner does to his dog, or as a cat lover does to his cat. On Thursday I had to euthanise one of my dear little fantails – the cheeky, chubby, always jolly, Squirt. Squirt had a terminal illness and the vet advised me to put him down. Trouble is due to the logistics of moving tanks of water around, vets will recommend that fish owners perform the deed themselves. At home. She gave me an anaesthetic. A tiny bottle. Only two drops of it were needed to kill him. It was a gruesome task. I had to remove Squirt from his tank and put him in a plastic container filled with water. Then I had to add the anaesthetic. I had to watch the whole thing in case he began thrashing about, in which case I had to add more of the anaesthetic. I was in tears as I did it – he looked up at me just before I added the drops and wiggled his little tail as if to say I know. It’s OK. I added the drops and two seconds later he was dead. Floating upside down. Just like that. 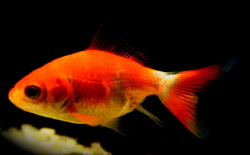 It’s hard to take the life of a pet even if it is just a goldfish. I was attached to my dear Squirt. He was a funny little guy. He loved shelled peas and dried brine shrimp. He used to surf in the bubble pipe. He had eyes like a hawk, as soon as you walked into the room he would swim to the front of the tank and wait for you to come over. It was sad going back to his tank after he was gone and seeing his two tankmates, Fatty and Jerry, looking around for him. Fish bond quite closely and really notice when one of the school has gone. They have been subdued for days, swimming slowly, searching every corner of the tank for their old friend. It made me realise that animal grief is much like human grief. Maybe we are all more closely connected than we think. He knew, and it was okay. I’m so sorry, Selma. It doesn’t matter what type of pet you have. You bond with each other. I can’t imagine how difficult that must have been. Oh dear… I’m sorry Selma. My father used to have a big aquarium, the City changed one of the chemicals they were using for tap water, and it was going to affect fish in aquariums. So my dad dutifully went and bought the stuff to clean the water of chemical. Apparently the fish store clerk gave him the wrong product, and all the fish were dead within the week. He put away the aquarium. Just couldn’t deal with it. Sigh. Awww I am so sorry about your little friend. Lots of hugs and love, sweetie. I’m so sorry to hear of your ordeal. Pets are important to us, and it doesn’t matter what the species is, we love them, care for them, and when it’s time, we help them as best we can to move on. But it isn’t easy for those of us left behind, human or otherwise. Hugs and comfort to you, m’dear. I’m sorry to hear the news about Squirt. I feel for Jerry and Fatty also. A Couple that I know has a pair of turtles, Flipper and Molly.I can’t imagine how they would feel if the had to put 1 down. The turtles love each other and their human friends love them. I haven’t had any pets for 10 yrs. I always thought about fish. I would enjoy making the aquarium a nice place, and getting to watch the relationships grow.I wouldn’t have to train them or discipline them. I hope you feel better soon. Oh honey….thats soooo sad. Im sorry. We took our beta fish, Spot, on our temporary move to a different state last year. Unfortunately, he was already pretty sick…and the drive just made it worse…and it was such a horrible thing to watch him struggle. PAISLEY – I have seen that with dogs too. I had two dogs years back and when my older dog, Henry, died, George mourned him for over a year. I almost couldn’t stand watching his grief. He would sit by Henry’s old pillow and just wait. It was heartbreaking. NAT – I am so sorry to hear that about your father’s aquarium. I would have been heartbroken. I would probably have packed the aquarium away too. When you can’t trust the water it’s a real problem. Awwww, I feel for him. HILLY – aww, thanks hon. You are lovely! GERALDINE – they can become important to us, can’t they? Part of the family really! PUNATIK – I am feeling better. I feel a sense of relief, so I know I did the right thing. Squirt had fish cancer. I didn’t even know fish could get cancer. It was horrible. I am glad your friends have such lovely pets. Turtles are awesome creatures! AVI – how nice to hear from you. Sorry to hear about your beta. It is hard to watch. You feel so helpless, don’t you? I really appreciate the visit! My daughter’s house is a regular menagerie, and my grandchildren are upset … sometimes distraught … when one of their cats, rabbits or budgies dies. But, they’re so dispassionate about their fish; they just go down to ‘Tropicalworld’ and buy more. But, they do insist upon the fish being given a ‘proper’ burial … throwing it in the garbage just won’t do. However, people do get attached to fish … we used to have a tank in the crew-room where I worked, and I remember when a cold snap combined with a power cut killed many of them. I came in to work, to find a crusty old Warrant Officer, with over 30 years service in tears over it! So, sorry for your loss!! Selma so sorry about your loss. I know how much more terrible it is when you’re the one who has to euthanize the pet. Because we live in such a rural place, we were twice met with that decision. In the first we had to do it because the disease the dog had was highly contagious. In the second none of us could do it to our Bear who had been with us for 13 years. In the end, the latter decision was the worst. We spent three gruesome weeks watching him die. Never again. Even now I can’t get over it. If we can, we must limit suffering- always. You did everything out of love and that is a good thing. TRAVELRAT – that is a really touching story about the Warrant Officer. It’s always the toughest guys who are the biggest softies at heart. Awwww. LAURI – I have watched a cat die and I know what you mean, I just can’t do that ever again. It is pure torture. Even though my old cat was 19 and suffering, I couldn’t bring myself to put her down. After a week I’d had enough and took her to the vet but it was a week of unnecessary pain. I’ll never forgive myself. Oh, that’s so sad. I’m sorry for your loss, but at least you helped make it a quick and comfortable transition. I also had no idea they had a way to euthanise fish but I sure am sorry you had to be the one to actually do it. I had to have my two year old dog Lucy put down a few years ago. She was the joy of my life. I got her when I was first diagnosed with MS, just a coincidence, and we bonded instantly. It broke my heart to do it but she was really suffering with a neurological disorder, another coincidence, and I couldn’t bear to watch it another minute. I held her as they put the needle in and it was over just like that. It still brings tears to my eyes even today. Pets are as much a part of the family as any humans are. I hope you’re feeling a bit better now. POPPY – it was hard but after thinking about it over the weekend I do realise it was the right thing to do. I hate to see any animal suffer. GYPSY – I am feeling better. So sorry to hear about Lucy. That is really sad. For her to be suffering from a neurological disorder is uncanny. You’re right – they are a part of the family. Selma, what a perfectly, beautiful and touching tribute to a cherished pet-friend. I, too, have had to be the instrument when it came to putting an end to the suffering of a helpless living pet. It is then that we realize just how painful love can sometimes be. So sorry about Squirt, I know how much a bond with your pet can be no matter what animal they are. They become part of our lives and we can;t remember what life was before we had them. Even animals grieve. I know Mica was lost when my bunny died, she used to walk over to where Bunny’s cage used to be and look for him just like your goldfish do. Mica was also at my friend’s house when their bunny, Pepper, died and they told me that Mica cried. Animals are very smart! I’m sending you a big hug to you and your son. MARY – it is so hard, isn’t it? We just want the dear little things to stay with us always. You’re right – love can be enormously painful at times. Saying goodbye is always so hard. TBALL – I feel so sad thinking about Mica and the bunny. Animals are very smart and the hardest thing is they really miss one another. Such a shame. I think that Doc’s Girl has it exactly right, “We are all connected…”. The birds, the fish, the dogs, the turtles, the rabbits, the whole darn lot. I have even seen wasps and dragonflies interact with each other by chasing each other around the pool playing ‘games’. They would actually alternate, chasing one another around the pool in reverse directions ‘playing tag’. They know and at an intuitive level, we know too. If Squirt had the ability to articulate in human ‘thought terms’ I think that the thought would probably have been, “There is no greater gift…”. Chin up, Fatty and Jerry need you! CHRIS – aww, you’re making me cry here. If only more people thought like you the world wouldn’t be in such a state. I am really moved by what you said. Thank you. I only said it because I really believe it (and you deserve it). I have seen and experienced so many ‘out there moments’ that people either wouldn’t believe me or I’d be labelled as insane so I don’t share them but of one thing I’m sure, inter-connectedness and empathy are irrevocably entwined. I was having a chat to my mum the other day and was explaining to her that with my current worldview I think that I’d prefer to be unsane, how can one possibly link sanity with the atrocities that occur either through design or a lack of care? On a lighter note, I do listen to classical music (and much more) and you are spot on about Beethoven’s 9th. See, there is still hope, all you have to do is read the other posts on this page. Hi Selma–I’m just now getting caught up with your blog–I’m days behind! SO sorry to hear about “Squirt”–what an adorable name.Reading about your feeding him shelled peas and brine shrimp, and your delicately helping him to go to the next level–peacefully–raised a lump in my throat. I’m so sorry, honey. How very fortunate he was to have you as his guardian, and pal! I DO believe we’re all connected. I know Squirt appreciated you. Again, I’m sorry for your loss, Selma. Yes, we are all connected and the smallest life is important, the passing of it worthy of grief. I’m so sorry, Selma, for your loss of dear little Squirt. CHRIS – I am so touched by what you have said. I can relate completely to how you feel about the world. Thank you from the bottom of my heart! LISA – awwww, thanks, hon. We are all connected, aren’t we? Every animal, every person, is worth something and is important in the scheme of things. I do believe that! SAINTPAULGRRL – thank you so much for your kind words. I loved that little guy and I think that had to count for something. I love your new avatar, by the way. Gorgeous photo of you! PWADJ – awww thanks hon. So kind of you to say so.